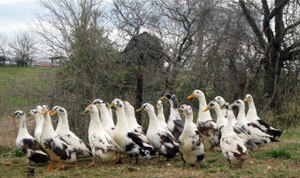 At Spellcast Farm we maintain a flock of rare Ancona Ducks. The Ancona duck is listed as "critically endangered" by the American Livestock Breed Conservancy. It is considered a dual-purpose breed meaning the females lay a good number of eggs (210-280 per year) and grow large enough to be used as a meat bird. The meat is high quality and like most heritage breeds, is more flavorable and less fatty than the commercial (hybrid) breeds. The Ancona is a beautiful duck and has a calm demeanor. We raise our ducks on pasture and feed them a grain mixture containing predominantly whole, locally-grow grains and seeds. During the cold months, they receive some conventional laying pellets to keep their protein levels up. Once the grass comes in, they go back to just whole grains and seeds. Our products are available on the farm by appointment. We also offer several deliveries to Hickory.